Securely connecting your small business to the outside world is as important as connecting your internal network devices to one another. Cisco Small Business RV Series Routers offer virtual private networking (VPN) technology that lets your remote workers connect to your network through a secure Internet pathway. 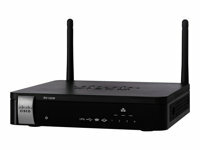 Highly secure broadband connectivity, high-speed wireless networking, and remote access The Cisco RV130W Multifunction VPN Router delivers highly secure broadband connectivity, high-speed wireless networking, and remote access for multiple offices and remote workers. Built for maximum flexibility, it delivers a comprehensive combination of business-class features and ease of use in a scalable solution. 4-port Gigabit Ethernet managed switch The Cisco RV130W features a built-in 4-port Gigabit Ethernet managed switch that lets you connect network devices and transfer files and data at high speed, providing the power and performance you need to keep multiple employees productive. Intelligent quality of service (QoS) features let you prioritize network traffic to keep critical network applications like voice and video running at their best. Untethered connectivity To provide untethered connectivity to employees throughout the office, the Cisco RV130W also includes support for wireless-N technology. This multifunction device can serve either as a wireless router, wireless access point, wireless bridge, or repeater, providing investment protection and flexibility when business needs change. You can get started using the RV130W in the way that best meets your needs, then change modes, and repurpose the solution as your business and network grow, resulting in maximum return on your technology investment. Enterprise-class encryption and authentication For employees who need to connect from home, on the road, or from remote offices, the Cisco RV130W features integrated enterprise-class encryption and authentication, including support for IPsec and Point-to-Point Tunneling Protocol (PPTP) VPN client connections and IPsec gateway-to-gateway VPN tunnels. Advanced virtual network support lets you set up wireless guest access hotspots to provide highly secure connectivity to clients and visitors. Simple configuration and easy set up Easy to set up and use right out of the box, both solutions feature simple wizard-based configuration to get you up and running in minutes. 3G and 4G WAN failover connectivity Cisco RV130W has a USB port to enable 3G and 4G WAN failover connectivity that is also perfect for remote regions or temporary connectivity. This multi-use router is a cost-effective way to provide business-class performance, security, and reliability your employees need today, with the flexibility to change as your business evolves. 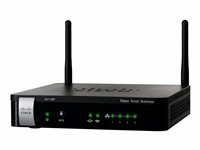 The Cisco RV215W Wireless-N VPN Firewall provides simple, affordable, high security, business-class connectivity to the Internet from small offices, home offices, and remote locations. It offers a combination of business-class features, support for virtual networks that help enable secure guest access, simple installation, and top-quality user experience. This takes basic connectivity for small businesses (with five or fewer employees) to a new level, delivering support for the latest technologies.